Blaise watches from a safe distance on Chapter 8 Page 28. Things have gone terribly wrong. 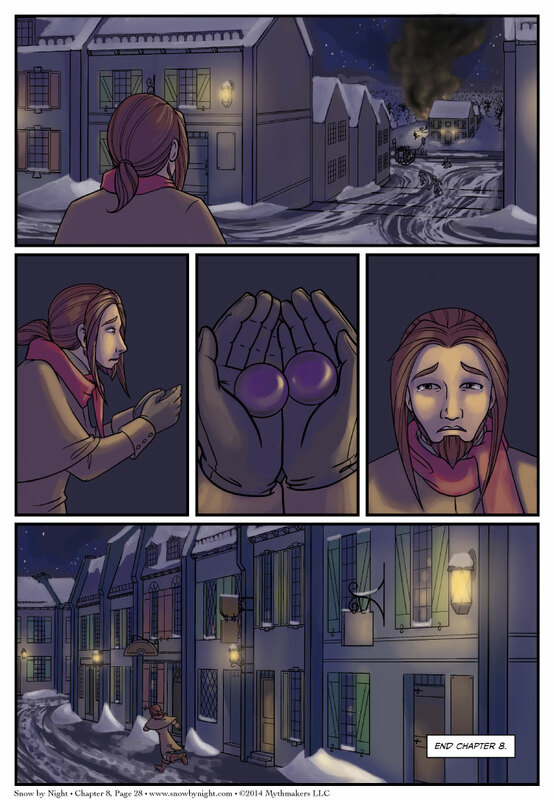 All he has left are the two amethysts that were Snow-by-Night’s eyes. And with that we end Chapter 8. On Wednesday, we’re beginning Birds of a Feather, the vignette for Chapter 8. For this story, we’re going back in time by two years to see how Blaise and Jassart met. As an incredibly special treat, our guest artists for the vignette are Shazzbaa of Runewriters and Steph Stober of Final Arcanum. 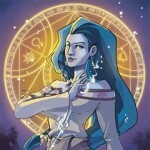 To see a preview of their take on Jassart and Mathilde, please vote for Snow by Night on Top Web Comics. Art Contest news! 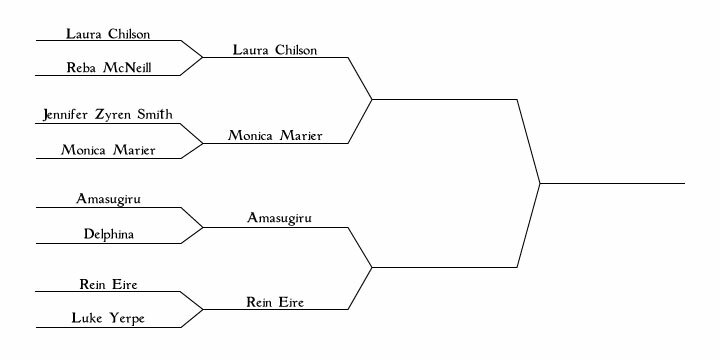 We’ve made it through the qualifier round so I’m pleased to announce the Elite 8. Using the vote tallies, I’ve created the bracket below. The voting is now up. So vote for your favorite today. You can vote once a day through Saturday at midnight. Well, Blaise, I hope for your sake that it was worth it, potentially killing two people for a creature you barely know. I certainly don’t think it was. Hey, it’s not like he set up a dangerous containment spell in a room full of volatile, explosive material. Jassart and Bertrande were the engineers of their own demise. I don’t think that letting snow be killed was a wise choice either..
excuse me..that “was” was meant to be a would be. English is still a bit hard for me to write..
Two people who were about to murder a sentient being, lest we forget. How well he knew any of the parties involved is irrelevant. And it’s not like he *intended* to endanger their lives. He may have acted rashly, but they didn’t exactly leave him much of a choice. He killed Bertrande. No excuse. You have a funny notion of killed mate. Nobody killed anyone, you’re acting as if Blaise deliberately set fire to the whole entire lab whilst laughing maniacally and plotting to go massacre an orphanage. The whole entire fire was an accident and is ultimately no one’s fault. The *only* reason Bertrande died is because of her own and Jassert’s actions, if you really want to get technical. This whole entire situation wouldn’t have even happened in the first place if they hadn’t been plotting to drain Snow’s Aether. If *anyone* is to blame for these events transpiring, it’s them and no one else. She tried to murder someone, she got off far too easily. I think you’re being a bit hard on Blaise, Jeremy. Jassart and Bertrande WERE trying to “kill” Snow. He clearly cares for her, so I think Jassart was crossing a line, and it seems he was crossing it for selfish reasons. Also, this was AFTER Jassart drew a blade on Blaise, and Snow told them she was in pain. Torturing her, human or not, is not okay…Besides, I didn’t see an explosion happening from taking Snow’s eyes out — how could Blaise have known this would happen? So, its okay for Betrande and Jassart to die, and Blaise is a hero for saving an aspect of Winter, the most cruel of the four seasons? Cruelest of the seasons or not, she’s a sentient being, and murder is murder. If a cop shot someone to stop them from committing a murder, would you say he was in the wrong? In any case, I don’t see how Blaise could have known that his actions would have such a disastrous result. As for Betrande’s motives — if a doctor kidnapped and vivisected someone in order to develop a cure for cancer, would you say he was doing the right thing? (If you answered yes, your last name may be Mengele.) I know there’s no real-life parallel to what Snow is, but I still find it disturbing that you find it so easy to consider her a non-person. Why do you care so much where Snow by Night comes from or what aspect of nature her spirit is manifested from? A sentient being is a sentient being no matter where they come from, it doesn’t matter who or what they are. Seasons are neither good or bad or kind or cruel, they are completely inert and inanimate, even if the universe this story is set in has spirits and beings tied into its seasons and the come forth from them, so what? Why does it matter so much where they come from? A being’s point of origin or characteristics intrinsic to its back ground has absolutely no bearing on its inherent right to live. Killing another, sentient, living being is not ok and never justifiable when they’ve done absolutely nothing wrong. Farmer here, speaking on winter. Did you know that winter is a necessary season for many of the crops you eat? Without winter, no apples, because apple trees won’t set their flowers without freezing weather. Also, you won’t get much of various greens like spinach, because those crops prefer cold weather. Those are two foods just off the top of my head. Additionally, if you like living without parasites INSIDE YOU then you definitely want winter, because a hard freeze keeps the parasite levels low. That’s why the tropics, where there is no winter, are known for all kinds of parasites. Winter also allows for a time of rest, especially in an agrarian society. Do not knock it. As a season, Winter is a beautiful, if harsh, time that provides blessings along with its difficulties. If you even could kill it, you would not be gaining as much as you think. And besides, Snow is not Winter, just winter’s daughter. By clicking on the little “extras” link in the Topics line I was able to locate the entries and the qualifier round stuff, but can’t seem to find any way to do this bracket? We’re voting each tier one at a time. You can vote here. You can get there by clicking on the “Art Contest” on the front page. Save the life of an innocent over the lives of two guilty, greedy souls. I call that a win. Blaise will recover, because in the end he did the right thing. An innocent? Who says she’s innocent? Greedy? Bertrande wanted to put the aether to cure the next plague. i know it’s an older comment [just catching up on my reading since being on vaca!] but i did wanna point out that i think it’s fine to feel either way on this point! on one hand, what jassart and bertrande were doing was a bit morally grey, but they were doing it for a good cause. it was a means to an end for them. blaise also had good intentions — while Snow isn’t a ‘human’, she is someone who has a mind of her own and is learning what it means to be human…so for Blaise, there was no question. Bertrande simply wants revenge on what she believes is the mistress for whom her husband left her–the spirit of the north for which he was willing to risk his life and die rather than stay home with his wife. Bertrande is the heartless one who wants to torture and kill Snow because she thinks Snow is the incarnation of the allure of the north that the Voyageurs love more than anything and that she doesn’t understand. She’s the stupid one to store gunpowder near a fire. Pity her crazed state, but don’t blame Blaise for her death; he had little enough time and smarts to try to save a spirit he cared for. Is there a chapter 8? This is Chapter 8. Do you mean Chapter 9? We’ll start posting that on June 30. Just a small clarification. Winter said “eight score seasons.” So a bit longer than 2 years. As for the rest, interesting theories. RAFO! Now I have to say that I am puzzled – as I am not native english speaker, this one is slightly difficult for me to digest – and the dictionary isnt helping much. A score is an antiquated way of saying 20. So eight score seasons is 8 times 20 or 160 seasons. Father Winter is difficult in all things, including his counting. It’s his nature. I think I’ll stop commenting, since people here are starting to think I’m some kind of monster for disagreeing. I’m never going to believe that Blaise was right. Ever. For no reason. And people are going to be bothered by that. As such, I’m from now on going to agree with the majority. Because that’s what people want: agreement. You had mentioned resuming the story on June 30th… and it’s now July 9th. What is going on? My daughter died unexpectedly on June 24. I extended the hiatus by three weeks. There’s long explanation on the Snow by Night home page. I am sorry to hear of your loss. I understand (and hope others do also) that you need time to heal, to get your emotions and life back on tract. In my opinion the story is not your priority at this time. Take time we can wait. Sorry, there’s no problem with disagreement, but your tone is combative which makes it seem like you want people to argue with you. There’s a way to start a debate and a way to start an argument. You usually start the latter with your tone.